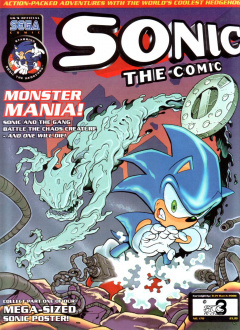 Sonic the Comic #176 is the one-hundred and seventy-sixth issue of the Sonic the Comic series by Fleetway Editions Ltd.
From this issue onwards, the comic's logo is changed to its final design, and Sonic's artwork from Sonic Adventure is now used in the top left corner of the cover. This issue also marks the death of long-running character Johnny Lightfoot. Sonic's eyes have turned green after having come into contact with the mysterious monster. His fellow Freedom Fighters are understandably worried, though Sonic insists he feels fine, and the glow gradually fades, though his irises are still green. Porker Lewis arrives, having studied the monster and determined that it's made of Chaos energy. He has brought some equipment that can defeat the creature, but Sonic is confident that they've seen it off, just as it bursts from a manhole behind them. Meanwhile, in the dark dimension, Dr. Robotnik observes the creature attacking the heroes, to which Grimer explains that he released the Chaos creature in an attempt to motivate Robotnik. He had read Robotnik's notes that the creature is uncontrollable, but he found a device known as the Anti-Chaos Nullifier that they can use to control the creature after it defeats Sonic. Unfortunately, the device doesn't work, so Grimer has effectively doomed everyone on Mobius since Chaos cannot be stopped. Regardless, Robotnik is interested in what may happen. Data Zone: The Data Zone acts as a quick reference guide to new readers about the characters, providing data files on Sonic, Tails, Knuckles, Amy Rose, Dr. Robotnik, Grimer Wormtongue and Chaos. Curiously, Tekno the Canary has a data file despite having made her final appearance in issue #174. Graphic Zone: Fan art submitted by readers. The theme for this issue's Graphic Zone is "Musical Mayhem", featuring pictures of the comic's cast playing on instruments or as parodies of real-life singers. Owners of the printed art each won a Sonic the Hedgehog digital watch. The first part of a mega-sized Sonic poster. This page was last edited on 19 March 2019, at 14:24.